At the center of an old city of Barcelona, a Gothic Quarter is situated. This part of the city is very popular among the tourists. Each street and building is literally saturated with the history. Here, you may spend all the day, finding out mysterious and interesting facts, at which you would definitely be astonished. There will be more time for the sightseeing, if you hire a car in Barcelona. In order to put a good spin on the events of the expiring day, have a dinner at one of those cozy and quit restaurants. Black Remedy is situated in the very heart of the Gothic Quarter. People, who have been to this place, call it “unique”. Black Remedy is having huge glass windows, for the visitors to have a look over the street, which is but a few steps from known to everyone Plaça Sant Jaume. The project of the restaurant, which was created by an architect J. López together with the designer M. Abrigador, is combining such details, as the classic colorful vaulted ceiling, together with a modern open layout. 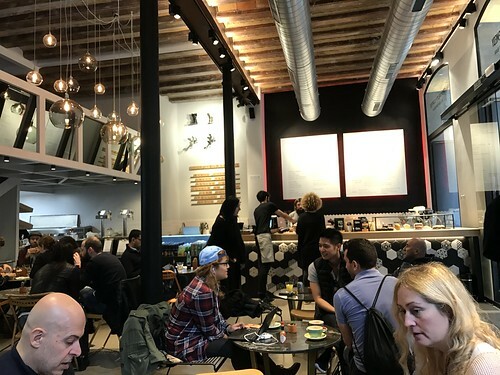 The wooden furniture and smoked mirrors, as well as the marble tables and the ceramic tiles, are the reference to the cafes of the 20th century. The coffee, used in the Black Remedy is growing on the local areas. The menu is offering nutritional and healthy dishes. The sandwiches, which are made from their own bread, baked in the wood-fired oven, taste fantastic. When you are sitting in this restaurant with the high timbered ceilings, drinking a cup of an addictive coffee, you feel the real spirit of Barcelona. 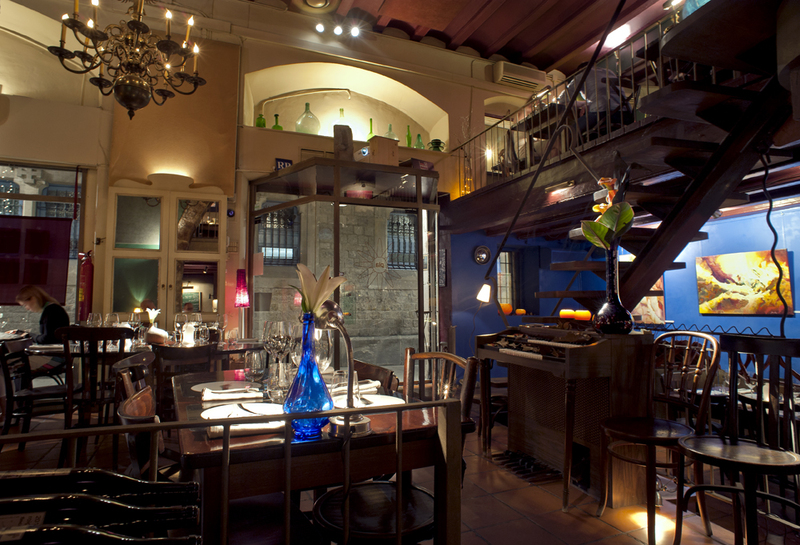 For over 35 years already, you may try more, than 150 Spanish wines at the La Vinateria del Call restaurant. This selection is impressive and the prices would suit every customer. The menu of the restaurant is extensive, there is a wide range of cheese and meat dishes, the portions of the traditional tapas are truly generous. La Vinateria del Call could be called “a hidden place”, but when you find it, you do not regret. At first, this restaurant, with wooded furniture and the dusty bottles on the shelves, may seem too dark and quiet. However, when you are making yourself comfortable, listening to nice music and talking to the friendly staff, this place is becoming lively for you. Try their cured meats, made from the highest quality ingredients. For example, spicy Chorizo Picante, Fuet (dry thin sausage made from the pork gut), and Longaniza with black pepper, which are produced not far from Barcelona. The most popular type of meat at this place is Jamon Iberico de Bellota. This is a jamon, made from the hindquarter of the free grazing Iberian pigs, which were eating only the acorns. The candle light and relaxing music is making this restaurant, hidden on the narrow street, intimate, mysterious and cozy. For almost 20 years, the PLA is known to be one of the best restaurants at the Gothic Quarter. Here, mainly the Mediterranean cuisine is served, but the dishes from the other cultures are served as well. The items from the menu are frequently changing, so their dishes would still surprise you at your second, and the following visits. The staff are friendly and always ready to explain the menu. They would recommend the wine, based on the food, you have ordered. Thanks to the beautifully presented dishes and the stylish décor, PLA restaurant is the perfect place for a romantic dinner in Barcelona. This vegetarian and vegan restaurant is offering very healthy, tasty dishes. The food is made from the organic, local, seasonal ingredients, most of which are bought directly from the producers. Many of the vegetables are grown on their own garden, which is not far from the city. Even the distance, within which the ingredients were brought, is written in the menu, near the names of the dishes. The ingredients’ highest quality together with the dishes’ reasonable prices are making this place one of those, where you want to return. The people, who are working at Rasoterra, are dedicated to their work and very sincere. The selection of the wine is superb, as the owners of the restaurant are having an eye for its best types. This is a beautifully designed place to spend quality time with your friends and family. What is especially loved by most of the visitors is the eco-friendliness of this place. The water used both for cooking and for drinking, is filtered right at the restaurant. The Rasoterra own bread is made daily, using the sour dough method. This restaurant is certified as 0 miles by Slow Food.